Hair Artist Association – #1 Social Network for Hair and Beauty Industry Professionals. The Hair Artist Association is a global association for Hair Professionals, Beauty Professionals, and Suppliers. The Hair Artist Association is a dedicated information portal and community for brand new and experienced hair and beauty industry professionals. 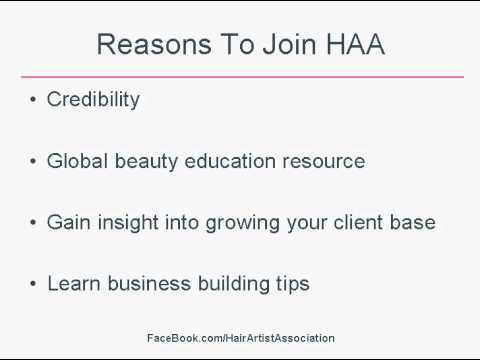 The Hair Artist Association Mission is to create a community for Hair and Beauty Industry Professionals to connect. The Hair Artist Association is a Social Network for Hair and Beauty industry professionals interested in learning cutting edge training, keeping up with the latest trends, business development, local events, products, networking and more…. You will be able to show other people that you are a part of a professional hair and beauty association; this builds your using us as third party credibility. Meet and network with like-minded beauty industry professionals, to include hair artists, salon owners, spa owners, nail techs, massage therapists, estheticians, beauty consultants, freelance hairstylists, platform artists, educators and business leaders, from all over the world. Business is going global. In that vein, the beauty business is experiencing international expansion at a constant rate. Techniques that apply to all races and ethnicities need to be taught and communicated in order for all beauty industry pros to work within this emerging trend. Let the Hair Artist Association help you in that educational journey. Stay on top of health trends that your customers should know about. Gain insight into growing your client base and building a loyal clientele through world class customer service. Learn business building tips such as marketing and salon development from those who have both a passion for and years of experience in the beauty industry. Explore numerous educational opportunities such as trade shows, webinars and publications through a centralized resource that will enrich your knowledge base and introduce you to fellow career oriented professionals. Knowledge, information and resources that will enhance the growth of your career in the beauty industry. Receiving exclusive joint venture and sponsorship offers.